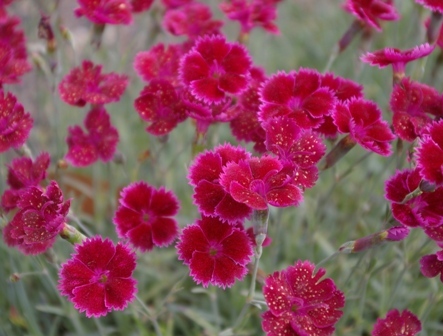 Joy Creek Photo Archive (c) all rights reserved Dianthus 'Crimson Treasure' is extremely fragrant. The flower color is reminiscent of an old, red velvet, ball gown. The ragged red petals are edged pink with flecks of pink throughout. 2 to 3 flowers per 10-inch stem. Blue-green foliage. Summer. 10 in. x 12. in.